Throughout the school year there are many smaller events held at the SOP in which ambassador volunteers are requested. The outreach coordinator works closely with the Director to recruit general ambassador volunteers for these events. The SOP Student Ambassador program hosts three mock interview days (two in the fall and one in the spring semester) for prospective undergraduate students to get a chance to practice and obtain feedback regarding their interview skills. The Mock Interview coordinator is responsible for coordinating these events. The SOP Student Ambassador program plans two open house events for undergraduate students each year, one in the fall and one in the spring semesters. Each open house has a theme that is selected by the committee. The open house is planned to showcase the day in the life of a pharmacy student. The Open House committee is overseen by two open house co-coordinators. Open house co-coordinator positions are a two-year commitment. Each year a new DPH-2 student is selected for one of the Co-Coordinator positions and is trained by the DPH-3 student who is serving their second year in the position. The Student Ambassador program is working to redesign and develop a website that will be on the SOP webpage. The Website coordinator is responsible for coming up with content and keeping the webpage up to date. Work together with a faculty member from the PPD division to plan a therapy lab demonstration for the attendees on the day of the event. In charge of developing flyers and advertisements for the event. On the day of the event, these members work the registration table to get all of the attendees checked into the event. Work with Bonnie Fingerhut to plan compounding lab demonstrations for the attendees on the day of the event. Work together within a budget to order food for the fall and spring Open House events. Also involved in this role is setting up the commons for the event and setting up lunch on the day of the event. Student connections leaders communicate with students in the incoming DPH-1 class. 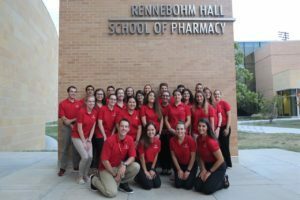 Once students find out they have been admitted into the School of Pharmacy, they are assigned to a connections leader whom is a current PharmD Student working through their second year of classes. This connections leader communicates with their group of students through e-mail during the months from their admission to when school starts. Connections leaders have opportunities to communicate in person with their DPH-1 students through the two-day DPH-1 orientation, and two colloquium periods during the DPH-1 students first year. Serving as a connections leader is a two-year commitment to the Student Ambassador Program. Feedback, questions or accessibility issues: sally.griffitihoh@wisc.edu.